Set up to record and celebrate the architecture of the late New Zealand architect Claude Megson, as examples of his work appear around the web. 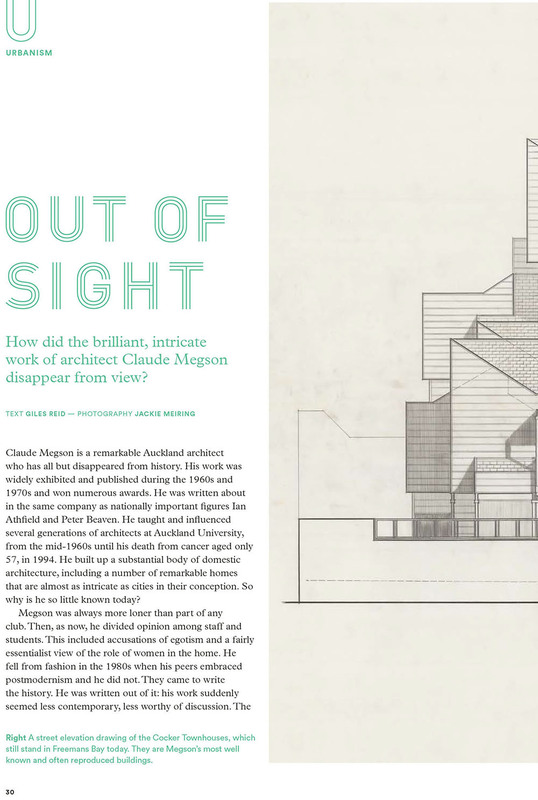 The November 2nd issue of Paperboy magazine gives eight whole pages to Claude Megson Counter Constructions, the first ever book on the work of this important but neglected New Zealand architect. His reassessment is long overdue. The beautifully-photographed book is self-published by UK-based architect Giles Reid, with generous backing from the Warren Trust. So here's your reminder that the last recommended posting date from the UK for Christmas delivery is Saturday 9th December. I hope you will take a look. 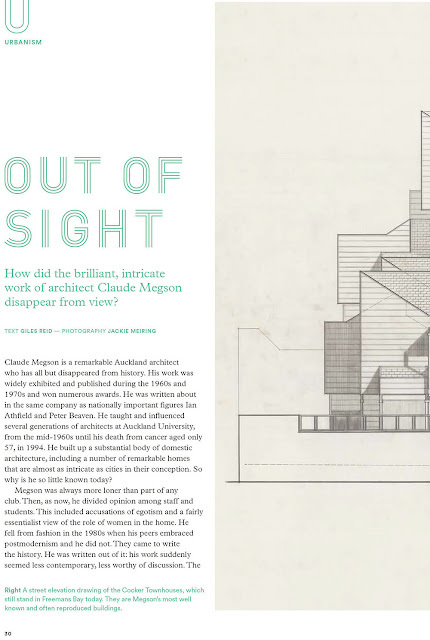 Welcome to the Claude Megson Blog, set up to record and celebrate the architecture of the late New Zealand architect Claude Megson as examples of his work appear around the web. Most of the pictures posted here come from Real Estate sites, from whom the pictures are harvested before they disappear. Claude treasured his clients' joy in their houses far more than he did publication in glossy magazines; he took as a mark of honour clients' longevity in the houses he designed for them. Consequently, photos of Megson houses up for sale only appear sporadically. Claude Megson was an inspirational architect and teacher. Several generations of Auckland architects are the better for his enthusiastic and knowledgable teaching, and many, many clients have been able to enjoy living in his enormously life-affirming houses. Beginning his architecural work with architects Gummer and Ford he was soon given a nickname he was quite happy with: "I was always happy to be called Frank Claude Wright," he used to say. There is an essential "rightness" about Megson's spaces, for pleasant occupation by ordinary, normal human beings. Such things, says Dickson, have gone out of fashion with today's students. Well, so much the worse for the students [and the clients of those students when they graduate!]. Perhaps it hasn't occurred to them that if they design real spaces for human comfort and pleasure, then even those anguished souls overwhelmed by post-Heideggerian "problematics" about the nature of their existence might, given spaces like Megson's to contemplate that nature of their "Being," come to more positive conclusions! Because that's the point about Megson's spaces; they are life-enhancing.